The summer has ended and the cooler fall temperatures have lured me out of my air-conditioned home onto the desert trails. 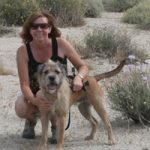 My first outing of the fall season was a day trip to a popular area in Anza-Borrego Desert State Park called Fish Creek Wash. I wanted to hike to the Wind Caves and explore other points of interest in this region of the Park. Fish Creek Wash is tucked between the Fish Creek Mountains and the Vallecito Mountains near Interstate 78, which runs through the middle of the Park. 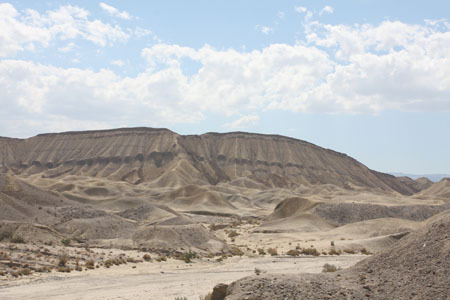 This area is abundant with geologic formations and history. Several noteworthy points of interest that can be incorporated into half- or full-day trips are nearby, and on the way to the caves. 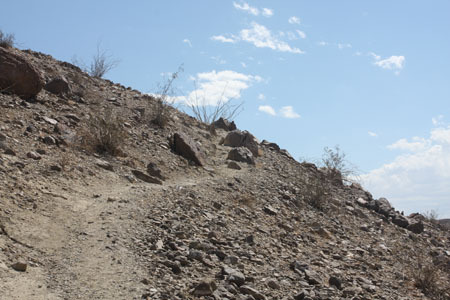 The trailhead to the caves can be accessed from Fish Creek Wash, an easy 4WD route that passes through Split Mountain. You pass through the Fish Creek Primitive Campground on your route to Split Mountain. As I drove through Fish Creek Wash I looked up through the sunroof often to take in views of the cliffs that towered several hundred feet above me on both sides of the wash. The road winds through a gorge that is a “split” between the Vallecito Mountains on the west from the Fish Creek Mountain on the east. Split Mountain Gorge was cut by an ancient stream that passed through the area millions of years ago. As I drove through the gorge I wondered how many millions of years old each layer was. Each layer of silt, rock and debris is a time capsule that holds evidence and clues of the flora and fauna that existed here eons ago. If you study the walls of the gorge you can see layers of rock and sediment that have been moved into twists and folds, buckled by seismic activity. 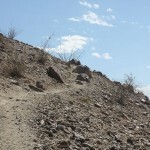 The trail is steep in several areas. From this point onward the wash meanders through the gorge and opens up to a wider area as you emerge from the split. To the left of the wash I noticed a sign indicating the trailhead to the wind caves. I pulled off to the side of the wash and got out of the Jeep. It was hard to see the trail at first. I scanned the area beyond the sign and noticed a faint scar on the steep hillside behind the sign and was able to follow it to the crest of the hill. It was hard to see what lay beyond the crest, but I was ready for an adventure. As I continued down the wash I took in the majestic scenery around me. There is an unusual semi-circular, twisted formation on the west wall (right side) of the gorge. It is called the “anticline,” a formation created by the impact of rock debris that pushed and buckled the sea floor during an earthquake that took place 5 million years ago. A cactus in bloom. 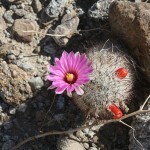 “The cactus is Mammillaria tetrancistra. A common name for it is Yaqui Mammillaria. According to the Jepson Desert Manual, M. tetrancistra is uncommon. 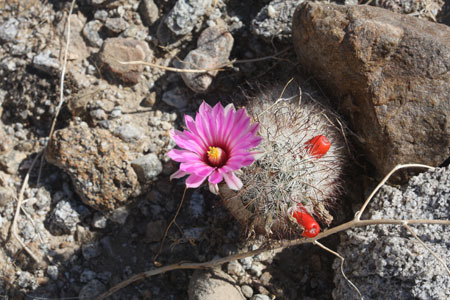 In Anza-Borrego, our common Mammillaria is M.dioica, or Fish-hook Cactus.” Source: Bill Sullivan. From the trailhead, the Wind Caves lie only a short 1-mile hike away, but the terrain is rough. Once you reach the top of the first steep hill, the views of the expansive badlands and protruding mud hills are breathtaking. There is a flat, rocky overlook area about midway through the hike to the right of the trail. Just near the edge of this area I noticed a pink flower against the stark landscape. It was a cactus in bloom. I was surprised as it was mid-September, late in the season for wildflowers. It did, however, recently rain in the area and that could have triggered a non-seasonal blooming period. From the overlook area I was able take in a magnificent view of the Elephant Knees mud hill formation just south of the Caves. As I stood there all I could hear was silence. The desert is so quiet, a peaceful retreat from the familiar sound of ringing telephones and cars speeding by. Elephant Knees mud hill formation. There were a couple more steep slopes to navigate before I finally reached the Wind Caves. From afar, the caves appear as dark holes; close-up they contain sculpted arches and passageways embedded within the sandstone formations. They have been formed from the effects of wind and time, eroding the Imperial Formation, an ancient marine bed, to create these shallow caves in the sandstone landscape. As I wandered through the caves I tried to imagine how the wind, water and time combined forces to create such a place. How old were these caves? Did it take hundreds, thousands, or millions of years to create these formations? After researching the topic I wasn’t unable to find dates on the caves. I did learn that Anza-Borrego Desert State Park holds some of the richest fossil deposits on Earth, bearing marine reefs, lake deposits and silt dating from 500,000 to 5 million years ago. Once you arrive at the wind caves, take your time and explore the caves. There are plenty of shady areas and nooks where you can enjoy the peaceful scenery while having a picnic lunch or resting up for the hike back down the mountain. If you are not up for hiking, you can still enjoy the many points of interest in Fish Creek that are accessible by car. A trip through Fish Creek Wash guarantees visitors an up-close view of history as it is preserved in layer upon layer of mud, rock, silt and fossils. Time, weather and geology have created many interesting formations in the area. 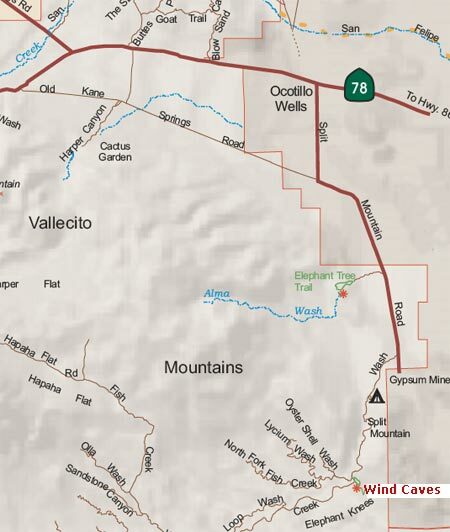 Points of interest along this route include: The Fish Creek Primitive Campground, Anticline, Wind Caves, Elephant Knees mud hills formation, Fish Creek Wash, and Split Mountain. Map to the Wind Caves. 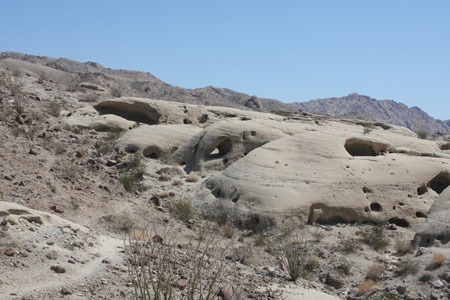 Fish Creek Wash is located within the boundaries of Anza-Borrego Desert State Park. To reach Fish Creek you can take the Kane Springs/Split Mountain Road from 78. From Indio, CA take the 86 South and take the 78 West just past the town of Salton Sea. It was about a 1 hour and 20 minutes drive from Indio, CA to Kane Springs/Split Mountain road turn off. View a video of this area. Day Trip #1: The Wind Caves at Anza-Borrego Desert State Park | Desert Road Trippin’ great article thank you. Haven’t been to that part of Anza Borrego for years. Your trip report makes me want to go check it out again.